D.J. Williams, PhD is a visiting professor with the Department of Sociology, Social Work, & Criminal Justice at Idaho State University. He has written a couple of academic articles (in print) on the vampire community. He is interested in conducting a qualitative research study involving real vampires. The objective will center on how comfortable real vampires are or are not in divulging their vampire identities to a clinician (social worker, counselor, psychologist, personal physician, etc.) and why or why not. He feels that while these disciplines promote acceptance, welcoming of human diversity, social justice, cultural competence, etc., there is much progress yet to be made. In other words, this research perhaps may illustrate a need for professionals to expand their range of acceptance of people with diverse identities, beliefs and lifestyles. The study will involve either a semi-structured interview or a short, open-ended written questionnaire. He does not need a particularly large sample (15+ is adequate), but the inclusion criteria is fairly specific. A. Background: The study will be broadly situated within a social work perspective for several important reasons. First, my academic background is in social work and leisure sciences, so that's what I know best! Second, cornerstones of the social work profession include the recognition and celebration of human diversity, advocacy and the promotion of social justice, building human relationships, and self-determination. Social work is a common profession, and social work journals reach large academic and professional audiences. Social work is directly and practically relevant to promoting understanding and support of alternative identities, communities and lifestyles. Overlap in ethics and values with related professions (counseling, psychotherapy, etc) will also be noted. B. Primary Purpose: The purpose of this study is to explore issues related to the disclosure of vampire identities to various clinicians (social workers, physicians, psychologists, counselors) using "thick, rich description." In other words, the primary research question centers on whether or not participants have or would disclose their vampire identities to such professionals. If so, what factors were important in shaping this decision and how did the disclosure process go? If disclosure has not occurred, then what are the constraints to such disclosure? The overarching goal of the study is to help professionals become more sensitive about vampire needs and issues (from the positioning of clinicians' own professional values and ethics). C. Methods: I will primarily use qualitative methods shaped by a community-based research perspective (research should be designed to be beneficial to participant communities, as well as others). Participants will be real vampires (not enthusiasts, wannabes, fetishists, LARPers, etc) who have identified as a vampire for several years (I haven't set a numeric value here yet). Elders, particularly, would be excellent candidates for inclusion. If the study is funded, I will likely use in-person semi-structured interviews (approx 60- 90 min using note-taking), or possibly focus groups. If funding is not secured, I will likely use a short, open-ended written questionnaire, which can be returned to me via email. Common themes emerging from data will be identified using content analysis methods, and the study will be written and submitted to an academic journal. I will need approximately ten participants, although a few more would be optimal. D. Approximate Timeline: Possible funding sources will be identified and a small grant written during Spring 2011. Grant will be submitted Spring 2011 or Fall 2011. Human subjects review (University ethics formal review process) will be completed early Fall 2011. At Idaho State University, oral history methods are exempt from review, thus I am anticipating either exemption or expedited review depending on the particular methods used. Thus, data collection would likely begin late Fall 2011. Analysis, reporting and submission to an academic journal would occur Spring / Summer 2012. Please note that participant confidentiality is protected per accepted university research standards, and no identities will be revealed in data reporting. Participants' identities and responses will remain anonymous. POCATELLO � Idaho State University Assistant Professor of social work D.J. 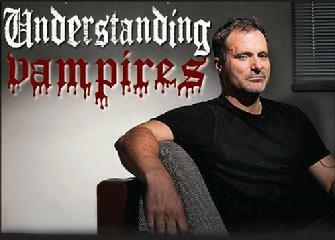 Williams is devoted to researching �self-identified vampires� and the vampire sub-culture and educating mainstream culture about them. Williams has published on this topic in peer-reviewed academic journals Leisure Sciences and Leisure/Loisir, and has acted as a consultant for the FBI regarding understanding vampire identities, issues and practices. He has also been approached as an expert for a proposed television documentary on these topics. �It has taken me a long time to get the trust to work with these self-identified vampires, because they are skeptical about how outsiders will perceive them and they feel that they are easily misunderstood,� said Williams, who has made contact with the vampire subculture in several large urban areas of the United States and Canada. Williams said as a social scientist he is not concerned with being able to scientifically define or identify those people who consider themselves vampires. Rather, his interest is to study and communicate about this self-identified group. Most large urban areas have a vampire subculture, he said. Self-identified vampires do not believe they are superhuman versions of various myths, according to Williams. Rather, these self-identified vampires are normal human beings who simply identify strongly with any number of traits associated with mythical vampires. In the public mind people who identify themselves as vampires may be seen as delusional, violent or dangerous, or identified with criminals such as Jeffrey Dahmer. Extensive demographic research conducted within the international vampire community shows that they vary considerably in ethnicity, religious affiliation, education, and psychological profile, according to Williams.